April 14, 2016 (San Diego’s East County) -- If you thought the El Niño rains this season lowered the region’s wildfire risk, you’re going to be disappointed. Unfortunately, they may have done the opposite: increased the fire hazards. March 6, 2016 (San Diego) -- Saving water is a good thing. It should never come back to bite you. The County of San Diego offers this advice on how to make sure your rain barrel isn’t breeding mosquitoes that could West Nile Virus or other diseases. March 4, 2016 (San Diego’s East County) -- It’s been a while, but El Niño rains are finally headed back to San Diego County this weekend. March 4, 2016 (San Diego’s East County) -- The sum of a strong El Nino and the effect of man's greenhouse gas emissions drove February 2016 global land and sea Troposphere temperatures to a 37-year record. February 16, 2016 (Oakland Calif.,) -- The Federal Emergency Management Agency (FEMA) today released new data on National Flood Insurance Program (NFIP) policies, showing an increase of more than 27,000 new NFIP policies written in California during the month of December 2015. There is a 30 – 90 day waiting period for new policies to be reported to FEMA and the latest available data, released today, shows an increase of more than 55,500 new flood insurance policies purchased in California from August 31 – December 31, 2015. January 18, 2016 (San Diego's East County) - El Niño has brought flooding since it has arrived in California this winter, but now those heavy rains may finally be doing something to help us. The snowpack is higher than it has been in years, and reservoir levels in San Diego County are looking better than they have in the last four years of drought. January 8, 2016 (San Diego's East County) - If you have damage from this week’s storms, the County wants to hear from you. Even if you live in a city within the county, it’s important for the County to get a report on all damages countywide. Below, Fox 5 TV tweeted image of news van on Mt. Laguna for a "San Diego snow day"
January 7, 2016 (San Diego’s East County) – After four years of drought, when it rains, it pours! During the past 72 hours, the National Weather Service reports heavy snowfall in our local mountains including 12 to 15 inches on Mt. Laguna. 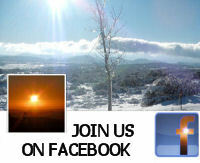 In addition, many communities soaked up several inches of rain, topped by Mt. Woodson with nearly seven and a half inches. Here are highlights on the snow and rainfall totals over the past three days. January 7, 2016 (Jamul) –Jodie LaRosh came upon this surreal scene this morning at 7 a.m. at State Route 94. At a dip in the road near Jamul Estates, rainfall had created a river flooding the road. At 8:02 a.m., CHP asked for Caltrans to shut down the roadway. A t 8:27 CHP observed that “water is getting pretty deep” and again asked for a shutdown at Honey Springs and 94. But at 8:41 a.m., inexplicably, CHP posted, “SR 94 will remain open –there is a foot of water crossing from the creek.” Signs were posted to alert motorists. El Niño has arrived and it looks even more powerful than expected, reminds Fire Chief Sam DiGiovanna. 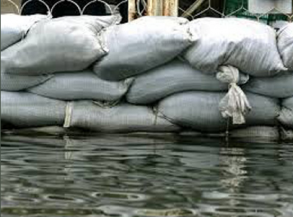 Don’t get caught in flooded waters and debris flow! You need to be aware of the potential flood and debris flow dangers associated with rainy days. Here’s what to do. January 6, 2016 (San Diego)--With floodwaters rising to the ceiling in several apartments and homes built below-grade on 48th Street in City Heights, residents scrambled frantically to evacuate their children, elderly family members and pets last night. A dog perished—but it could have been a far worse tragedy, if not for the astonishing courage of Gabriel Duarte. Duarte, a construction worker, surely knew the hazards of jumping into floodwaters that had submerged lamps and live electrical wiring – waters choked with debris, dirt, and potentially disease. Yet he risked his life to save others, entering several feet of water to unclog two submerged storm drains. Many of his neighbors credit him, for preventing further damage. He dove into the murky waters to clear two of the three storm drains that had backed up. December 15, 2015 (San Diego)--County Supervisors on Tuesday agreed to seek rapid deployment of state inmate work crews if El Niño packs a punch in the coming months. The board voted to approve Supervisor Dianne Jacob’s proposal to team up with Cal Fire and ensure that the region’s nearly 500 work crew inmates are quickly available to assist with flood prevention and cleanup. 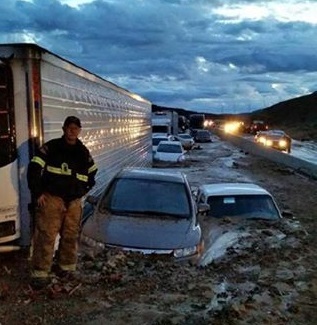 October 18, 2015 (Los Angeles)-Torrential rains and flash flooding turned hillsides in Los Angeles and Kern Counties into mudflows last Thursday that cascaded over two freeways—Interstate 5’s grapevine area north of Los Angeles and State Route 58 near Tehachapi. Hundreds of terrified motorists swept up in the mud flow escaped their vehicles as the freeways became muddy rivers. Firefighters and swift-water rescue personnel made daring rescues, pulling passengers out of windows as cars bobbed past. One pregnant woman escaped out the sunroof of her vehicle. Others remained trapped in their cars overnight, some with mud up to the windshields. Even semi-trucks became mired in the muck. 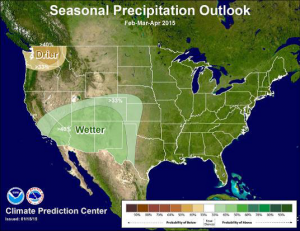 August, 17, 2015 (San Diego)—National Weather Service forecasters are predicting a wet winter in San Diego due to the probability of a strong El Niño, perhaps the strongest since records began in 1950. An El Niño occurs as a result of warming ocean surface waters which release heat into the atmosphere over the Pacific, creating a chain reaction that can result in cloud formation, storms and heavy rainfall. 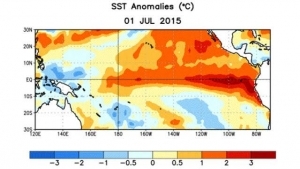 July 12, 2015 (San Diego)--An El Niño ocean-warming cycle is strengthening in the Pacific and could produce a wet winter for drought-stricken Southern California.